How to become healthy truck drivers. Problems that occur if your not healthy. Most members of the trucking industry admit there is a serious health crisis among truck drivers. The most obvious reasons for our conditions are sitting all day,smoking,poor eating habits,irregular sleep patterns,obesity,stress,the list goes on. Truck drivers are at more risk than average Americans for a number of health problems. 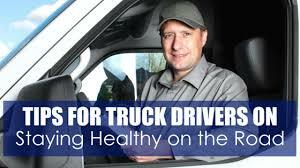 Obesity, is easily the most commonly occurring and preventable cause of disease that healthy truck drivers can avoid. About one in four has sleep apnea (a disorder that interferes with breathing during sleep and can leave you groggy and exhausted). Its hard but try too get at least 8 to 10 hrs of uninterrupted sleep everyday, this is important. Sleep deprivation causes all types of health issues. Your body releases hormones that heal and repair your body in stages of sleep. This process began only after about 6 hours of sleep any less and you are depriving your body of its natural healing process. Ever wonder why cancer, diabetes and high blood pressure affects so many people? Years of eating the wrong foods will sooner rather than later catch up with healthy truck drivers. Most people don't think about their health until there is a problem and then it's usually too late. Eat a nutritious breakfast . Never skip breakfast. It wreaks havoc on your body. It tells your body to store fat and sends your body into survival mode. Breakfast is the most important meal of the day, it literally jump starts your body and it's the only meal of the day that you can eat more of and not gain fat because its all consumed/burned quickly for energy. Drink water like a fish. It cleanses your body and flushes a lot of toxins out of your body, fat too. Drink a gallon a day if possible. Cut out cola. To become healthy truck drivers. Also instead of 3 meals a day, try to eat 5 or 6 small meals, this will speed up your metabolism and in turn your body will burn more calories. Lean chicken,fish and beef...more fruits and veggies(raw is better more nutrients) nuts like almonds and whole grain whole wheat bread and brown rice. Stay away from the white bread and rice(all of the nutrients are bleached out). If you want to eat healthy and stay fit you have to eliminate certain foods from your diet. Cakes,pies, pastries,honey buns, doughnuts, cookies, ice cream and other sugar coated goodies. Fried foods: fried chicken, fried fish, fried pork chops, country fried steak, squash,okra, onions and any other fried food you may be tempted to eat. Pizza, white bread, burgers and fries, sodas, chips and Doritos, cheese, sauces and dips, white rice, most canned veggies(they are loaded with sodium and preservatives). If you continue to eat these foods you will continue to gain weight and do all sorts of harm to your body. Drastically cut back on your salt and sugar intake. The foods you need to be eating are as follows: Meats boiled, steamed or grilled chicken breast, lean fish(salmon,tuna), lean beef steaks(sirloin tip,loins) London broil, lean ham(not country ham), fresh veggies: broccoli, spinach, sweet potato's, peppers, green beans. Fresh fruits: apples,pears bananas,blueberries,pomegranates, oranges, mango's. Fresh fruits and veggies are a must. Drink water like a fish, at least a gallon a day. Brown rice,oatmeal, whole wheat whole grain bread. Fat free yogurt is also a good source of calcium. Stay away from whole milk, if you must have milk drink fat free or 2%. Forget the old adage of 3 meals a day. You need to eat balanced meals every 2.5 hrs a day(this speeds up your metabolism and turns your body into a fat incinerator)at least 6 meals a day. Green tea instead of coffee and honey instead of white sugar. If you don't already have a refrigerator or electric cooler than you will need to invest in one. Many of us are overweight and suffering with health issues that are directly related to being overweight. People who are overweight have problems like high blood pressure, heart disease, and diabetes in much greater numbers than people who maintain a normal weight.